There are three types of layers you can use depending on the type of graphics and artwork you are aiming to achieve: bitmap, vector, and 3D. Bitmap Layers: Allow you to create 2D graphics that are resolution independent. Bitmap graphics are made of pixels on a grid that resemble tiny dots, which altogether make up the drawing you are creating or artwork you are importing. Bitmap graphics impart a more natural and soft look to your work. The colour is defined on a pixel-by-pixel basis. Vector Layers: Allow you to create 2D graphics that are made of many individual, scalable objects. Each object is created by a mathematical equation rather than pixels, so they always display at the highest quality. Because they are scalable, vector objects are resolution independent. You can increase and decrease the size of vector objects and your lines remain crisp and sharp, which is ideal for cartoons! On vector layers, the colour is defined for the whole stroke. Vector objects can consist of lines, curves, and shapes that you can edit and transform using control handles. Vector graphics are not restricted to rectangular shapes like bitmap graphics. You can place vector objects over other objects, and the object below will show through. 3D Layers: Allow you to import 3D objects into layers, creating a project that mixes 2D and 3D styles—see Adding 3D Objects to the Storyboard. You can add an unlimited number of layers to a panel. From the Thumbnails view, select the panel to which you want to add a new layer. ‣ Select Layer > New Vector Layer or New Bitmap Layer. ‣ Click the New Vector Layer or New Bitmap Layer button in one of these areas: Layers toolbar, Stage view, or Layers panel. You can delete layers you no longer need. This keeps your project clean and tidy. ‣ Select Layer > DeleteLayer. ‣ Right-click the layer’s tab and select Delete Layer. ‣ In the Layer toolbar, click the Delete Layer button. ‣ From the Layers panel, click the Delete Layer button. 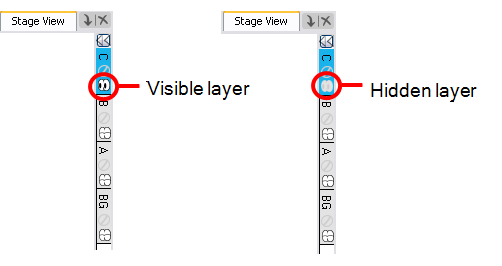 ‣ In the Stage view, click the Delete Selected Layers button. Working with many layers, it may be useful to hide certain layers. 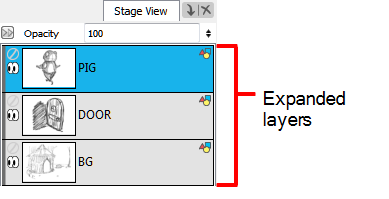 ‣ In the Stage view, click the arrow button to expand the layer tabs. Select the tab of the layer you want to show or hide. 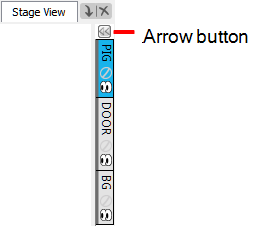 ‣ Click the Show/Hide Layer icon. ‣ Select Layer > Show/Hide Layers. ‣ Right-click the layer tab and select Show/Hide Layers. You can lock the currently selected layer to protect any objects on it from being changed. Once locked, you can unlock the layer to make changes to any objects on it. Select the tab of the layer you want to lock or unlock. Click the Lock icon, located directly under the layer name. • Select Layer > Lock/Unlock Layers. 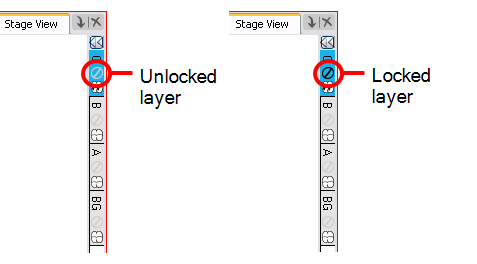 • In the Layer toolbar, click the Lock/Unlock Layers button.